Have you heard of bone broth? If you’re an active reader of articles in the pet, human wellness, sports or food space, you’ve definitely heard about the seemingly miracle benefits of this popular superfood. At this time, I haven’t been able to make bone broth at home, so I was excited to get a chance to work with Primalvore to try their new beef and chicken broths and research the health benefits to find out just what all the hype is about, and whether the benefits are overblown, or if we all truly need to have a few pouches of this tasty stuff in our dog food cabinets. What I found was pretty amazing! This is a sponsored post, I was given free samples and compensated in exchange for my honest review. I only promote products that me, Matilda and Cow have used and love. Bone broth is highly palatable, making it an excellent way to encourage your dog to drink more water. I love Primalvore’s reclosable twist-off cap, which makes it super convenient for taking along on hikes, walks and other adventures. 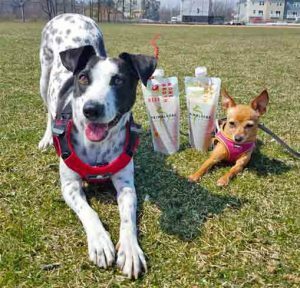 Just like people, dogs should be offered a drink before, during and after exercise. Studies on humans suggest that bone broth can help speed up recovery and reduce muscle and joint soreness after high-impact activity. 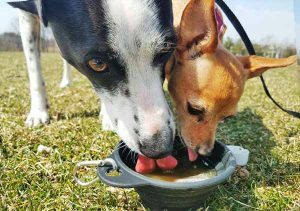 While there’s still not a ton of data on all of the effects of bone broth on dogs, it seems very likely that the benefits for canine athletes go way beyond hydration. Since dogs do not sweat, they do not lose electrolytes when they exercise. They do, however, lose electrolytes through vomiting and diarrhea. Primalvore is shelf-stable, as long as it’s unopened, you can keep it in your cabinet for up to 18 months so you always have it on-hand in case your dog gets sick. Many dogs seem to be suffering from itching related to intolerances to common ingredients in commercial dog foods. In fact, Cow was one of those dogs. She ate a chicken flavored kibble for a few months and developed an intolerance to it. Her skin became red and inflamed, she lost a lot of fur on her chest, and she was miserably itchy. Switching to a chicken-free kibble helped somewhat, switching to fresh, raw food cleared it up and helped her fur grow back. But it seems strange that so many dogs, like Cow, are suffering from food intolerances. One possibility is the widespread occurrence of Leaky Gut Syndrome, in which the small intestine allows particles of food to pass into the bloodstream and attacked by the immune system, causing inflammation and symptoms like itching, gas, diarrhea and chronic ear infections. Leaky Gut Syndrome may be caused by processed diets, antibiotics and over-vaccination. This is a big topic that warrants its own blog post. To put it briefly, so many non-digestive symptoms start in the gut. The collagen in bone broth may help repair the small intestine and resolve these symptoms. However, supplementing your dog’s diet with highly digestible bone broth is just one part of an effective plan to fight Leaky Gut. You should also eliminate possible allergens and feed as many fresh foods as possible. There’s a few reasons why I’m choosing to promote Primalvore over other brands, and why I think it’s worth purchasing even if you make your own. The bones used to make Primalvore are organically sourced, from free range chicken and grass-fed beef. Since it’s specially formulated for dogs, it’s low in sodium and has no toxic ingredients like onion, which can be found in bone broth products made for humans. As is, bone broth contains collagen, which has been shown to help arthritic dogs become more mobile and experience less pain and lameness. Primalvore is fortified with additional collagen peptides, plus turmeric, a yellow spice that has been used for hundreds of years to ease pain and inflammation – and curcumin, found in turmeric, has been backed up by scientific research to be as effective relieving pain as aspirin, and can even fight cancer. Primalvore recommends a daily serving of up to 2 ounces per 20 pounds of dog. You get 12 ounces in each pouch, which, once opened, stays fresh for up to a week in the fridge. You can also freeze the broth in a silicone ice cube tray to make tasty cold treats to help your dog cool off in the summer heat. I’m planning to drop a broth cube into a water bottle before heading out for a hike so we’ll have flavored water by the time we stop for a water break. 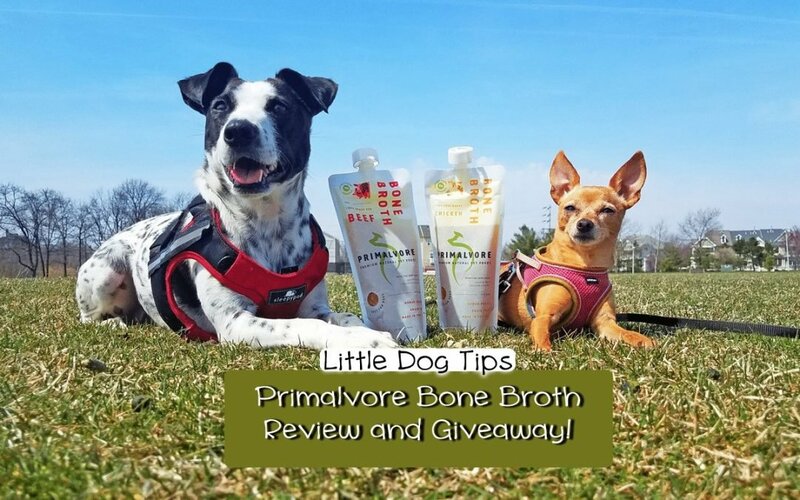 Primalvore bone broth can be served as an in-between meal snack or poured over your dog’s dry, canned or raw food. Try Primalvore Bone Broth For Free! 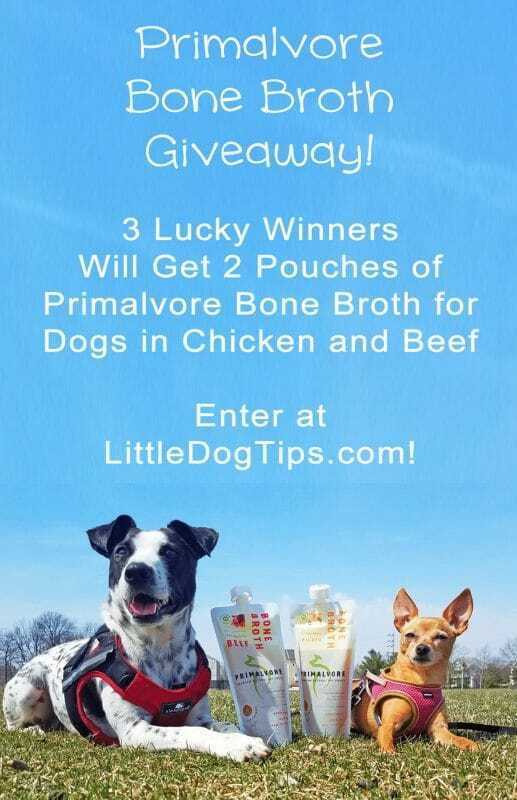 Enter to win two pouches of bone broth in Free Range Chicken and Grass Fed Beef. Three lucky winners will be chosen after the entry closes on May 11, 2018! Must be 18 or older to enter, USA only. Can’t wait? 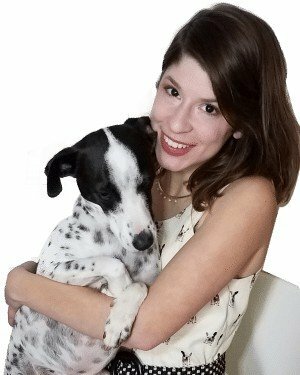 Get 20% off your purchase at Primalvore.com by entering our discount code DOGTIPS at checkout. Bark Potty Review/Giveaway - A Mess-Free Alternative To Potty Pads! Royal Canin Genetic Health Analysis (GHA) Review: Cow's Results! My dogs and cats aren’t just pets. They’re family. I am always looking for ways to help keep them healthy and happy. I’ve heard great things about the use of bone broth in keeping them healthy and have been wanting to try it. 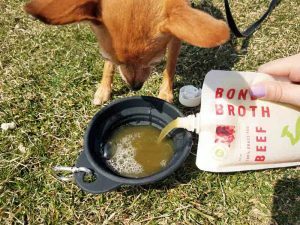 I do make my own bone broth, but knowing about this brand will be great for summer travel with my little doggie. I hope my local store will have it! I’d love to try it because I think it’s something my dog would really enjoy! I love giving my dogs something new every now and then. They would love this, thanks for the chance to win. i love bone broth for my girls. i sometimes will make my own but it takes so long, and it very time consuming and sometimes it does not come out right. i like top their meals with bone broth. Having a 90 pound mastiff/lab mix with back problems this sounds like a good addition to his diet and may help promote better joint health. It would definitely give him an added treat to his food! My Boston Terrier eats raw and homemade food, this would be a great topper. My chihuahua is only 2, but she had a broken hip as a very young puppy and it bothers her sometimes. The vet gave us a med to help when she is in pain, but I only give it to her on days where it is really bothering her. I have been thinking she could probably use a supplement that would help with arthritis. This looks like it’s so much better for my dog. It looks like my dog would really like it! I’m willing to try anything. I’m all for a healthy treat for my pup! I try to avoid giving him anything that will harm him in the future. I would like to win because my dogs are picky eaters and they need their nutrition. I would like to try this for my 2 French Bulldogs. I like it encourages them to drink more water for our hot Summer months. I’m always looking for healthy foods for my furbabies to try. Thanks for the introduction to this product! My dog needs to eat a prescription dog food that he does not love. I’m hoping it would help him enjoy meal times again if we try pouring it over his food. My grandpup is a picky eater. So I think this would be great for her. I think our dog would be a fan. In the past, when our Pomeranian has been ill with digestive problems, it is scary trying to get nourishment down him to bring him back to health. The last time, I got lucky and he liked small watermelon bits. I would love to give him something more substantial. I want to try this because I have a senior dog that could benefit from it. Id just like to treat my dogs to it. I want to provide my dog with the best possible. This looks like it fits that category! Because we LOVE our grand doggies SOOOOO much and we want the best for them and we know our adult kids (their parents do too!) I also am familiar with some of the health benefits of bone broth. Animals give such devotion and unconditional love and make us smile and laugh every single day and they deserve the best that we can give for them in return. Thank you for this chance. I would like to give my dog a healthy treat. My baby girl has allergies and we are trying to find ways to help her. She gets ear infections and the itchy skin too. Anything to help benefit my 5 little ones! They are all different and have their own issues whether it be age, itchiness or weak bones but I think they would all benefit from this in some form! I’m always looking for new treats for my girls. My shihtzu Peaches is my best friend. Her health is everything to me since I would be devastated if anything happened to her. I need to check this out for her! I’d like to have my older dog try this for his arthritis. I’d love to give them something new to try. I would love to have my dogs try this because I want them only to have the best. I have never tried this with my dog, but think it would definitely be beneficial for her digestive issues. I would like to try this to see if my dog will eat this on some of her food, she’s very picky and I need to find a way to get her to eat better. My dogs always get dry dog food, they would enjoy this on it. This will be good for our dog. I feed my dogs high quality dog food and treats and I’m always interested in trying a new product for them. I would love to try this because I’ve never given my dog anything like this, and it’s something different for him and see if he’ll like it. I would like to give this to Elvis on his dry food. I want to give it to him for his overall health. I would love for my dog to try! I want to try Primalvore Bone Broth because I know that my dog’s would really love it. I’m hoping it will help her arthritis. I’d love to try these b/c I try to give my girls the best of everything & keep them as healthy as possible! 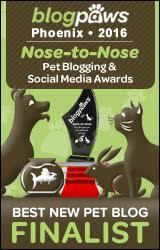 I would like to win this as all four of our furbabies are shelter babies. They have gone through so much before they adopted us and I would love to treat them. Our boys are getting up in age and this would help moisten their kibble. I make it at home and it would be nice to find a quality product I didn’t have to slave over. I have an older dog and I think it would be good for him. Why do you want to try Primalvore Bone Broth? One of my grandpuppies is getting up in age and has become super picky about eating. I worry she isn’t getting enough nutrients. I’d love to see if this would help by topping her dry food with it. I would love to find a better product than we currently use. I’d like to find a brand to use as a back up in case I run out of homemade. I appreciate your suggestion of using bone broth but do you really think these kinds of things will be useful without the recommendations of the doctors. I know a lot about the pets and I think we should consult the doctor before applying any remedy to our pets. That’s a good question, Fahad. A lot of holistic vets recommend bone broth, though I haven’t quoted anyone in this article. Conventional vets might also start recommending it to dogs who are recovering from illness or surgery, it’s one of those things that is fairly safe to try with your dog – though a lot of remedies online really can be harmful! 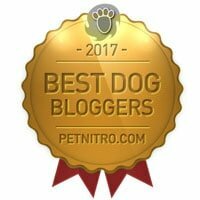 Dear Madam, Thanks for sharing Bone Broth Can Boost Your Dog’s Health and Primalvore Review. Interesting take on bone broth. I might try it for my dogs.